Did you know that Adobe XD supports 8 languages? As of this writing, XD supports English, French, German, Japanese, Chinese, Korean, Brazilian Portuguese, and Spanish. This means that many users around the world are already running XD in their native languages. If, as a plugin developer, you want to reach those users and provide the best experience, internationalization and localization are two things you should consider on your journey to creating an XD plugin. 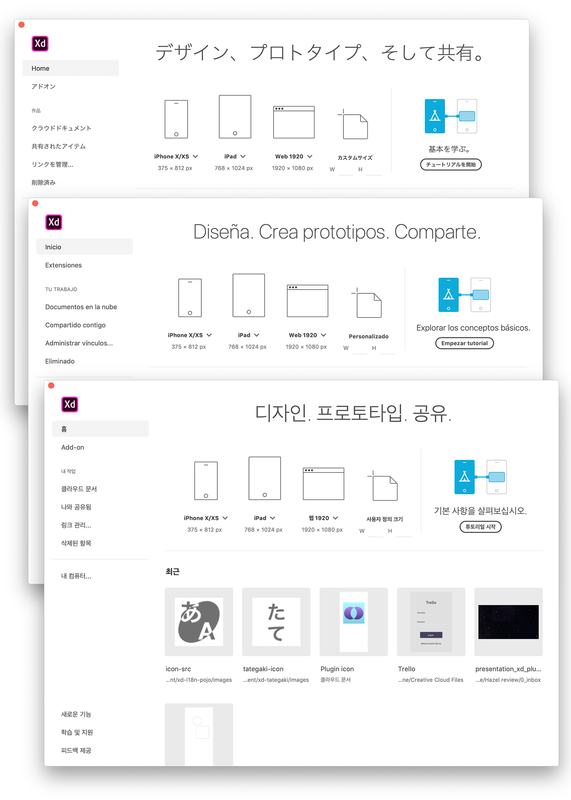 The Adobe XD start screen in Japanese, Spanish, and Korean. 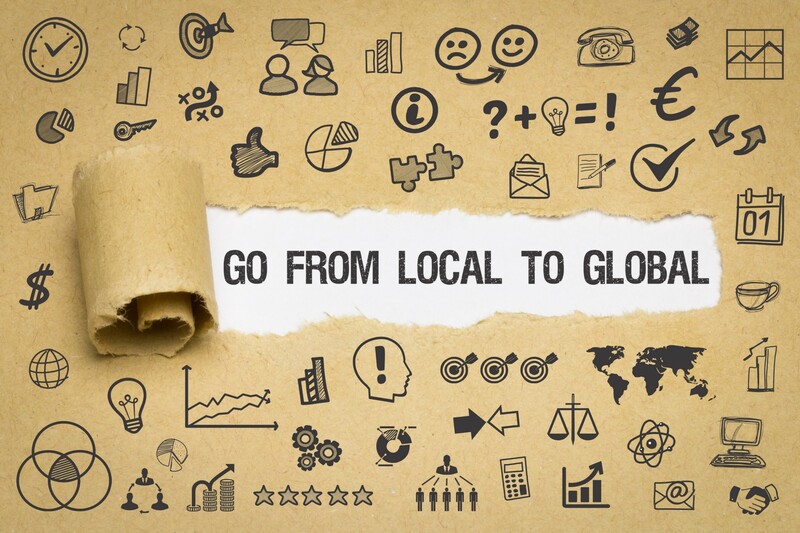 In the future, we’ll show you some other ways you could go about internationalization, and if you have your own approach you’d like to share, let us know in the comments. I’ve whipped up a simple repo so we can focus on the goal of internationalizing a plugin. You can follow along with this article by grabbing the full code on GitHub. It’s probably also a good idea to have the Adobe XD Platform documentation site handy as well. Before we get into any code, let’s make sure your manifest is ready to go. You can learn all about the manifest in our manifest reference. Here, I’ll just call out the things you need to do specifically when supporting multiple languages. Side bar: speaking of manifests, we’ve recently updated the I/O Console and our manifest requirements. If you’ve already built a plugin before March 2019, learn about changes to the I/O Console workflow and how to update your manifests for existing plugins. If you’re just following along with this article, don’t worry! We’ll use the updated manifest format. So if a user is running XD in Japanese, they’ll see my Japanese label in the Plugins menu. Otherwise, they’ll see English, my default language. If these are important to you (and I’d imagine they are! ), let us know in the comments, or in our developer forums. And be sure to keep an eye out; some of these will become localizable in the future. As developers, we generally aim to avoid hardcoding, but HTML doesn’t make it easy out of the box. … you have a hardcoded string. As part of internationalizing an XD plugin, we’re going to grab all of those “hardcoded” strings from the markup in our main.js file and place them in a separate JSON file. We’ll name this JSON file strings.json and it will sit next to our main.js file in our code base. After this, it becomes a matter of localizing the strings into the next language, or adding a namespace for a new language code when you want to support more languages. In the next section, I’ll assume you’ve already localized the Japanese strings (you can get them as part of the GitHub repo). In order to know what language strings to show in your plugin UI, we need to know what language the XD application UI is displaying in. … and the application.appLanguage property will give you a string, like "en" or "ja", indicating XD’s current display language. Knowing the application language, you’re ready to start displaying localized strings via your markup. Now let’s tie all of this together! Let’s refactor the markup in main.js to dynamically interpolate values from strings. Our plugin currently supports English and Japanese only. So what’s going to happen if our user is running XD in, say, Spanish? We’ll have a plugin that refuses to run, and errors in the developer console! … is evaluating as strings["es"].h1 (or more simply: strings.es.h1). The "es" there is for “Spanish”, but since our example plugin doesn’t support Spanish, our strings.json file doesn’t have a namespace for it. Hence the undefined error. Let’s make sure the plugin has a way to fall back to a default language. Get the array of languages you support from your manifest. Check if appLanguage is among those supported languages, and if not, default to the first language. In this example, supportedLanguages will be ["en", "ja"]. In other words, if appLanguage is supported by your plugin, use it; if not, default to your first supported language. We’ve now provided a fallback language since our plugin doesn’t support every language that XD does. And that’s it! At this point you’ll have a plugin that supports English and Japanese, and defaults to English for all other langauges. Is your XD plugin ready to go global? If you’ve already got some experience with internationalizing XD plugins and want to share your approach, please reach out! I’d love to hear from you if you want to internationalize your XD plugin and still have questions about how to set it up. You can find everything you need to build your XD plugin and join the XD plugin developer community through AdobeXDPlatform.com. Lead Technical Evangelist for the Adobe Creative Cloud Developer Ecosystem.